Sari or Saree is a traditioanl female garment wtih various styles of draping, varying from five to nine yards length. There are more than 80 recorded ways to wear a sari, Nivi style is the most common and there are more then 30 types of regional sarees are found in India. There are more than 20 types of sarees available in India they are Banarasi Silk Sarees,Kasheeda saree,Khun Saree, Kasuti Sarees, Chanderi Sarees, Tant Sarees,Kanjeevaram Sarees, Assam Silk Sarees, Batik Print Sarees, Tussar silk Sarees,assam muga silk sarees, Dhakai Jamdani Sarees,Panchampalli Sarees, Cotton Sarees,Patola Sarees,Leheriya Sarees,Maheshwari Sarees, Mundum Neriyathum,Bhagalpuri Silk Sarees and Pattu Sarees. Types of traditional wedding Sarees for Indian women include kanjeevaram wedding sari, Banarasi wedding sari, sambalpuri wedding sari, Assam silk, gota sari, Resham sari, Zardosi sari, paithani sari, Bomkai Sarees, bandhani sari and neriyathum sari. There are various styles of sari draping, Nivi style originated from Andhra Pradesh is the most common in India along with Nauvari from Maharashtra. The drape varying from five to nine yards Sarees and more than 80 recorded ways are there in several different styles and region. Banarasi Saree made in Varanasi and known for their gold and silver zari. The sarees are made of finely woven silk and among the finest sarees in India. Tant Saree is a traditional Bengali style saree made by the weavers and meant for daily use. Tant saree are most comfortable saree for the hot Indian summer. Chanderi Saree made in Chanderi town of Madhya Pradesh,produced from pure silk, chanderi cotton and silk cotton. Chanderi sari are also known for gold and silver brocade. Sambalpuri Saree is a traditional Handloom sarees, produced in Sambalpur and near by district of Odisha. The Sambalpuri sari reflect an original style of craft made from fabric woven on a hand loom. Kasta Sari also referred to as Nauvari is the traditional Marathi style of sari, a single nine yard sari that is worn very similar to the Maharashtrian dhoti. Chiffon Sarees are light weight fabric sarees made purely from silk. These sarees are one of the most appealing attire for Indian women. Georgette Sarees are also light weight attire made from silk with highly twisted yarns. These sarees are made in solid colors and prints. Kosa Sarees are one of the most popular sarees in India, available in different colors, patterns and designs. Kosa silk produced from larvae of several species of silkworms in Chhattisgarh. Net Sarees are made with a fabric with open spaces and come in different varieties. Different weaving patterns can be used for different kinds of netting. Bandhani is a tie dye textile process and the technique,variety and colour used in Bandhana are highly decorated. Bandhani Sarees are being sold all over India, especially during the festive and wedding seasons. Kasavu Sarees from Kerala are the traditional clothing of women in the state,especially during the festival and wedding seasons. The Kasavu Sarees is traditionally white or cream in colour and consists of two pieces of cloth. Patola Saree is a double ikat sari made from silk in Patan of Gujarat. These saris are most populara and very expensive, once worn only by royal and aristocratic families. Kanjeevaram Saree are weaved from pure mulberry silk thread, made by the weavers of kancheepuram. Kanchipuram Sarees has been recognized as a Geographical indication by the Government of India. Kalamkari Sarees produced in many different regions of South India and There are two distinctive styles of kalamkari art in India – the Srikalahasti style and the Machilipatnam style. Paithani Sarees are made from very fine silk, produced in Paithan town in Aurangabad. Paithani variety of Sarees are considered as one of the richest saris in India. Muga Sarees are produced in Assam from wild Muga silks,Pat and warm Eri silk. Muga silk was recognized as a protected geographical indication and used in products like saris, mekhalas and chadors. Puttapaka Sarees made in Puttapaka village of Nalgonda district in Telangana. 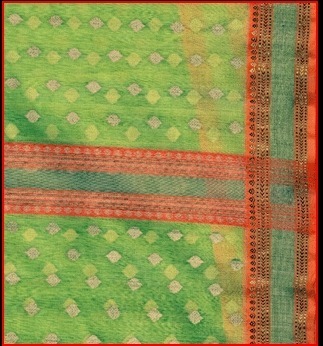 These Sarees are known for its unique Puttapaka tie and dye style and closely resembles Sambalpuri saree. Pochampally Sarees are made of one of the ancient Ikat weaving with traditional geometric patterns. Air India cabin crew wear specially designed pochampally silk sarees. Gadwal Sarees is registered as one of the geographical indication from Telangana and are most notable for the best Zari on the saris. These saris have been popular and consists of cotton body with silk pallu. Konrad Sarees also known as Temple Sarees are well known sarees from South India, originated from Tamil Nadu. 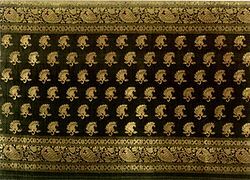 These sarees were originally woven for temple deities and one of the most expensive sarees in India. Ilkal Sarees produced in the town of Ilkal in the Bagalkot district and use of a form of embroidery called as Kasuti, a traditional form of folk embroidery from Karnataka. The embroidery include in Ilkal Sarees are like gopura, chariot, palanquins and elephants. Kantha type of embroidery and sarees are produced in the states of West Bengal and Odisha. Stitching of Kantha commonly known as Nakshi Kantha and traditionally worn by women in Bengal. Kerala Sarees is verly closely related to mundum neriyathum but consists of a single piece of cloth. Traditional and modern styles of Kerala Sarees are regarded as the cultural costume of women. Phulkari is a embroidery technique from the Punjab region and mostly used during marriage and other festivals. Phulkari embroidery most favoured colour is red and its shades. Chikan embroidery is a traditional embroidery style from Lucknow and one of the best known textile decoration styles. Lucknow Chikankari work embroidery sarees are one of the best sarees in India. Kota Doria Sarees made at Kota,Mau and and its nearby area, know for a bit of embroidery and border patches. Kota sarees are are popularly known as Masuria in the region. Baluchari Sarees worn by women across India, mostly Bishnupur and its surrounding places of West Bengal. The Baluchari Sari has been granted the status of Geographical indication in India. Mangalagiri Sarees and Fabrics are produced in Mangalagiri town of Guntur and registered as one of the best handicraft from Andhra Pradesh. 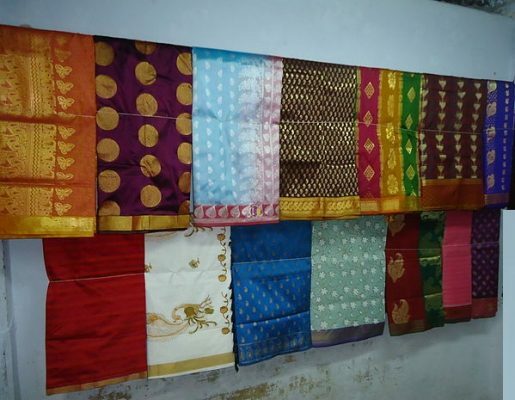 Mangalagiri saris are very unique in variety and has the most characteristic features. Bomkai Saree are produced by Bhulia community from Odisha state. Because of Bomkai sarees, the place is identified Geographical Indications of India and Aishwarya Rai wore a kind of Bomkai Saree. Gota Patti Sarees originated in Rajasthan,This type of Indian embroidery used extensively in wedding and formal clothes. The metal embroidery of Rajasthan is known as Gota work.